Only a few bacon manufacturers guarantee the gluten-free status of their bacon, while many others simply say their bacon products include no gluten ingredients, but may include trace amounts of gluten because they're processed in a shared facility or on shared equipment. The vast majority of bacon products don't include any gluten ingredients (bacon generally is made from just pork belly, salt, sugar, nitrates/nitrites, spices and possibly smoke flavoring). However, that doesn't mean your bacon is truly gluten-free—you need to check it for potential gluten cross-contamination. Applegate Farms. Applegate makes Canadian bacon, natural "Sunday" bacon (the regular crumbly variety that comes to mind when I think "bacon"), plus natural turkey bacon. Most of Applegate's products are gluten-free, according to the company's gluten-free list, including all bacon products. Armour. Armour, a division of the John Morrell Food Group, makes raw bacon, pre-cooked bacon, and pre-cooked bacon bits. According to a spokesperson, any John Morrell brand will disclose wheat ingredients on the product's label. Armour doesn't use barley, rye or oats in anything it makes. Bacon (and other no-gluten-ingredient foods) may be manufactured on shared lines, but the company follows strict protocols to avoid cross-contamination. Beeler's Pure Pork. Beeler's, a sustainable company that raises its pigs without antibiotics or growth hormones and with ample access to sunshine and socialization, makes several different types of bacon: Original, Pepper, Garlic Pepper and Apple Cinnamon. Company spokesperson Julie Beeler tells Verywell.com that everything Beeler's produces is gluten-free and is made in a gluten-free facility. Bob Evans. You might think of Bob Evans as a restaurant, but it also makes a long list of products for sale at the supermarket. The company maintains a list of "potentially acceptable retail products" for people with celiac disease, and that list includes bacon and Canadian bacon. Although I asked, the company did not provide information on whether its bacon is produced on the same equipment as gluten-containing products. Broadbent Hams. Kentucky-based Broadbent's makes five different kinds of bacon, including one that's nitrite-free. However, Broadbent's doesn't make any gluten-free claims, and several of the products it manufactures contain gluten ingredients. Butterball. Butterball is known for its turkey, of course, and the company's bacon product is actually turkey bacon. According to Butterball's Frequently Asked Questions page, only two Butterball products (Italian-style meatballs and frozen stuffed turkey) contain gluten. Dakin Farm. Vermont-based specialty food company Dakin Farm makes several really interesting kinds of bacon, including cob-smoked bacon, cob-smoked turkey bacon, cob-smoked maple-glazed bacon, Canadian bacon, and Irish-style back bacon. According to the company's gluten-free list, all bacon produced by Dakin Farm is considered gluten-free. Dietz & Watson. This maker of deli meats, sausages, and artisan cheeses is certified gluten-free by the Celiac Sprue Association, which requires testing to less than 5 parts per million of gluten in products. Dietz & Watson produces regular bacon and Canadian-style bacon. Farmland Foods. Farmland, which makes a bunch of raw and fully cooked bacon products, including flavored and lower-sodium varieties, has started to label a few foods "gluten-free," according to a company spokesperson. If that designation doesn't appear, it means the company won't guarantee that the product is free of gluten cross-contamination (despite an apparently safe ingredients list). Farmland will disclose any wheat-containing ingredients (as required by law). The dextrose in its products is corn-based, and the modified food starch used in some products is either corn- or potato-based, the spokesperson says. Godshall's. If you're looking for turkey or chicken bacon, that's what Godshall's specializes in. According to the company's Frequently Asked Questions page, nothing Godshall's makes contains gluten except for the Scrapple, which contains wheat. Hatfield. 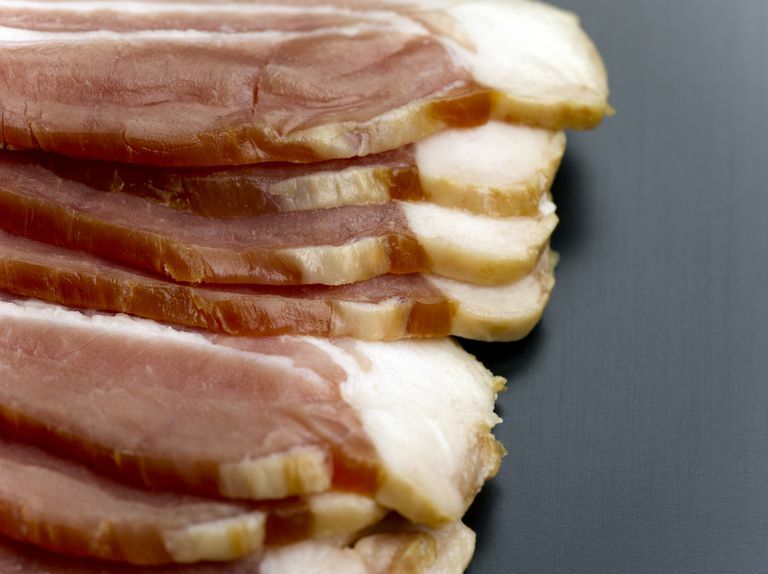 According to Hatfield's gluten-free products list, four types of Hatfield bacon are gluten-free: hardwood smoked uncured bacon, Cherrywood smoked extra thick cut triple-smoked bacon, Maple sugar extra thick cut triple-smoked bacon, and Hickory extra thick-cut triple-smoked bacon. However, exercise a bit of caution: a company rep tells me some of Hatfield's "gluten-free" products are made on the same lines as gluten-containing products. The company does completely wash down the lines between each product run, the spokesperson says. Jimmy Dean. Jimmy Dean, which is owned by Hillshire Brands, makes three different fully cooked bacons, but they are not tested for gluten, according to a spokesperson, who adds that no Jimmy Dean products are currently considered gluten-free (Hillshire Brands is considering adding more extensive gluten-free labeling in the future). Jones Dairy Farm. This company is certified gluten-free by the Gluten-Free Certification Organization, which means its products must test below 10 parts per million of gluten (lower is better). Jones Dairy Farm, which is a supporter of the Celiac Sprue Association and the Celiac Disease Foundation, currently lists five different types of bacon on its gluten-free list. Still, always check the label, since Jones does make a few gluten-containing items, too. Neese's Country Sausage. Neese's makes bacon as well as sausage, and its bacon does not contain gluten ingredients. Be aware that Neese's does make some products with gluten (its Country Scrapple contains wheat meal), and those products are made in the same facility as the ones that don't contain gluten. However, the area with the wheat is a part of the facility that's separated completely from where the bacon is made, a spokesperson says. Nodine's Smokehouse. This small Connecticut-based company calls its bacon "our pride and joy," and makes many different types. Nodine's bacons are free of gluten ingredients. The company does make two products (its English and Irish bangers) using wheat cracker meal. Nueske's Applewood Smoked Meats. Nueske's makes 17 different bacon options. According to the company's Frequently Asked Questions page, everything made by Nueske's (including the bacon) is considered gluten-free. However, some items are made by other companies and sold by Nueske's, so if you're buying anything else, you should double-check with the company to make sure those other products are safe. Oscar Mayer. Almost all of us can find Oscar Mayer bacon easily at a local store. Oscar Mayer is a Kraft Foods Co. brand, which means food labels will disclose the use of any wheat, barley or rye ingredients. However, Kraft does not guarantee that foods with any gluten ingredients listed are completely free of potential cross-contamination. Owens. Owens, produced by Bob Evans, makes one type of bacon. According to Bob Evans' celiac list, it's considered "potentially acceptable" for those following the gluten-free diet. Smithfield. A major producer of pork products, Smithfield makes several kinds of bacon, including one that's lower in fat. Smithfield will clearly identify any gluten ingredients on its product labels, so your best bet is to check the label of any bacon you're considering. The company only uses gluten-containing ingredients in a few products these days, and has eliminated them (along with other allergens) at most of its processing facilities. Where allergens are in use, Smithfield employs a strict procedure to limit cross-contamination. Wellshire Farms. Wellshire Farms maintains a searchable allergen database that allows you to select for foods free of gluten, dairy/casein, soy, corn, nuts, pepper, garlic, and mustard. Fourteen different bacon products—including turkey bacon and beef bacon—appear on Wellshire's gluten-free list. Wright. Wright is part of the Tyson Foods, Inc. conglomerate, and makes many different types of bacon using "real hickory wood smoke—never liquid smoke." According to a Tyson customer service representative, Wright and other Tyson brands will clearly disclose any gluten-containing ingredients on the label. Tyson cleans its production lines between products, she says. As you can see from the above list, the vast majority of bacon does not contain gluten ingredients. So if you're not particularly sensitive to trace gluten, you may be fine with most bacon products. One more point on bacon: some manufacturers of liquid smoke flavor actually use barley malt powder to make their products (barley, as we know, is a gluten grain). If your bacon maker can't guarantee the liquid smoke in the bacon is gluten-free, definitely choose a different product (many of the brands use real smoke, not smoke flavor, to make their bacon).